OMAHA, Neb. – As a result of Habitat for Humanity of Omaha’s partnership with the SpartanNash Foundation and the 14 Family Fare Supermarkets, Supermercado Nuestra Familia and No Frills stores in and around greater Omaha, the local Habitat affiliate recently received a $14,000 donation. The donation – which took place on April 7 at the Elkhorn Family Fare Supermarket located at 1221 S 203rd Street in Omaha – will help build hope and affordable housing for Habitat homebuyers. Holding the donation check, from left: SpartanNash Senior Director of Retail Operations Lonnie Eggers; Habitat for Humanity of Omaha Gifts In-Kind Director Michele Shearer; Elkhorn Family Fare Store Director Tom Goolsby; and 24th St. Family Fare Store Director Chris Wilde are joined by SpartanNash and Habitat for Humanity associates. Between Feb. 8 and 19, the SpartanNash Foundation hosted a companywide retail scan campaign in SpartanNash corporate-owned stores in eight states. Store guests and company associates who visited the stores during the 12-day retail scan campaign had the opportunity to donate $1, $5 or $10, with 100 percent of dollars raised going to support 79 Habitat for Humanity affiliates such as Habitat for Humanity of Omaha. Families and individuals in need of a hand up partner with Habitat for Humanity to build or improve a place they can call home. Habitat homeowners help build their own homes alongside volunteers and pay an affordable, interest-free mortgage. Through financial support – such as the donation from the SpartanNash Foundation and 14 Family Fare Supermarkets, Supermercado Nuestra Familia and No Frills stores – volunteering or adding a voice to support affordable housing, everyone can help families achieve the strength, stability and self-reliance they need to build better lives for themselves. 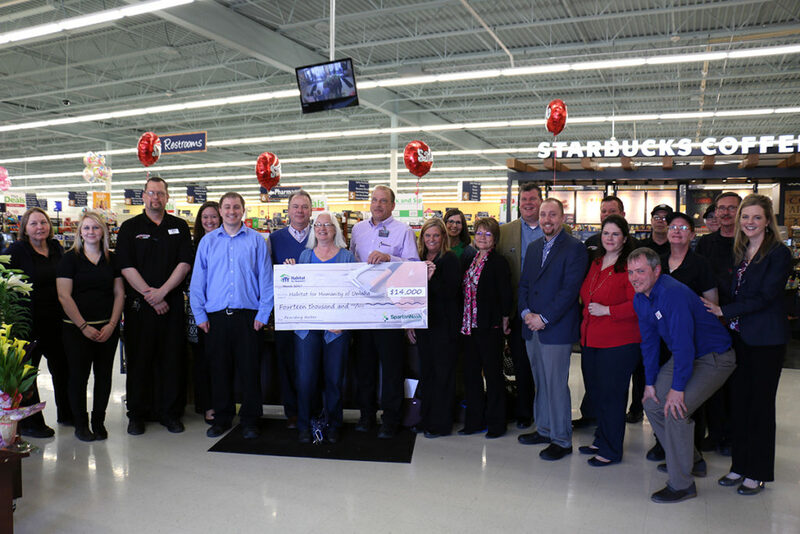 SpartanNash – which owns the 14 Family Fare Supermarkets, Supermercado Nuestra Familia and No Frills stores in greater Omaha – underwrote the cost of the fundraising campaign so that all donations will benefit Habitat for Humanity of Omaha.